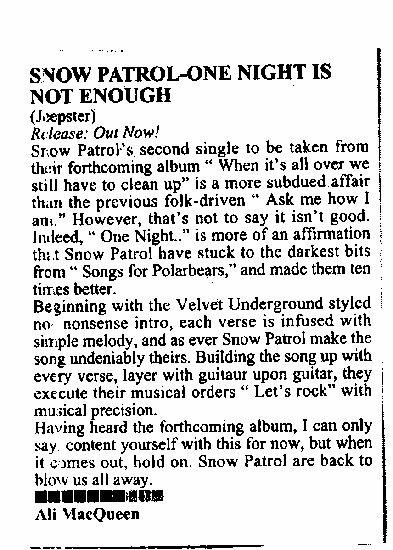 Snow Patrol’s second single to be taken from their forthcoming album ‘When It’s All Over We Still Have To Clear Up’ is a more subdued affair than the previous folk-driven ‘Ask Me How I Am’. However, that’s not to say it isn’t good. Indeed, ‘One Night…’ is more affirmation that Snow Patrol have stuck to the darkest bits from ‘Songs For Polarbears’ and made them ten times better. Beginning with a Velvet Underground styled no-nonsense intro, each verse is infused with simple melody, and, as ever, Snow Patrol make the song undeniably theirs. Building the song up with every verse, layered with guitar upon guitar, they execute their musical orders ‘Let’s Rock’ with precision.